The first TX-TERT team to deploy included two team leaders and four team members who departed from Arlington, TX, at 1530 hours on August 28, 2017, en route to Aransas Public Safety Communications in Rockport, TX. Update: I spoke to Team Leader Jennifer Veber who advised she is working the 7AM-7PM shift along with Team Members Nathan Alvarez and Christine Thompson. They are staying at the Service Center which is a five minute drive from Dispatch. They were provided running water, food, cots and goodie bags that include toiletries and other essentials upon their arrival at the service center. Team Leader Ayanna Barnes along with Team Members Chassidy Osman and Leslie Weinrich are working the 7PM-7AM shift. Attached is the evening updated provide by Brittney from Team Leader Jennifer Veber. Jennifer indicated during the call that a neighboring agency lacks in supplies. TX TERT Staff will start working on having items sent to the agency in need. Update: Team Leader Veber advised that herself and Team Member Thompson did mostly call taking throughout the day. The majority of their calls included citizens needing information and disturbances. Team Member Alvarez was utilized for dispatching in the DPS EOC. Team Leader Barnes advised herself and Team Members Osman and Weinrich spent the day surveying the area and taking the time to prepare for their upcoming shift. They came into the center early so that they had a chance to get acquainted with the system. Special Needs/Requests: Team Leader Jennifer Veber has requested supplies sent to the neighboring agency, San Patricio Sheriff’s Office. While on duty today she was told that San Patricio Dispatch have no supplies and are strictly eating MRE’s, Meals ready to eat. Update: Team Leader Barnes advised that the Team took turns dispatching in the DPS EOC and call taking in the Aransas Public Safety Communications Center. Most of their calls consisted of animals calls, looting calls, welfare concerns and persons calling trying to donate to affected areas. Update: Team Leader Veber advised they had a great day in the PSAP. More of the PSAP’s radio channels are becoming available, so she spent part of the day testing and assigning those channels. Team Members Alvarez and Thompson spent the day in the PSAP and the DPS EOC dispatching and calltaking. The calls were more frequent and tended to be more police related issues. Team Leader Barnes advised the Telecommunicators at the PSAP were in need of a couple of supplies, so Team Leader Barnes, Team Members Osman, and Weinrich drove to Corpus Christi to gather a few things. The Telecommunicators have expressed their sincere gratitude and are happy to have relief. Update: Team Leader Barnes advised they had a busy evening, the call volume contained looting calls, disturbances and a lot of fire and medical calls. There is no gas in town; they have to travel to Portland or Corpus Christi to fill up. They are not aware of any shortages in either of those two towns. The Team was all smiles when I spoke to them and seemed to be in great spirits. Update: Team Leader Veber advised they had a fairly quiet day. They have plenty of supplies and are being fed well; an Officer even brought in Olive Garden from Corpus Christi. The PSAP supervisors are finally taking a day off tomorrow, which Team Leader Veber advised was much needed for them. The PSAP Manager has given an indication that the Team will, in fact, be needed for the full seven days however she is not sure at this point if they will be needed after that. Update: Team Leader Barnes advised the call activity has increased since the citizens have been let back into the city, mostly suspicious activity calls and disturbances. There is still no gas within about a thirty-minute radius, but they are not in need of gas at this time. Update: Team Leader Veber was excited to report that the TERT Team got to meet and shake hands with Senator Cruz. She said there were a lot of pictures taken, so they are going to try and track them down. Tomorrow a group of Telecommunicators from Corpus Christi is coming to assist in the PSAP so that the entire PSAP can go to dinner together and enjoy a night off. Supervisor Lee Zapata has advised that she needs the Team for the full seven-day deployment but does not think she will need an additional deployment. Team Leader Veber was in great spirits when we talked and said that the entire Team is as well. Update: Team Leader Barnes advised everything is business as usual. The calls are steadily picking up and becoming more normal type calls. A lot of people are calling wanting information on how to donate as well. Team Leader Veber also stated that calls were starting to increase. The TERT Team along with two dispatchers handled 90 percent of the load today so that the Rockport Telecommunicators could take a break. They are currently having one dispatcher sitting in the lobby area to talk to citizens that are coming in to report things as well. That dispatcher enters the call into the CAD system just like they would if they were taking them over the phone. Currently, Team Member Alvarez is working that area. Special Needs/Requests: Dispatcher Supervisor Zapata told Team Leader Veber that she would like a second team on standby for possible deployment. I will follow up with her tomorrow. Update: The Team had a great day. Team Leader Ayanna advised that they had a busy night including an incident with a shots fired call, but everything turned out fine. Team Leader Veber advised the PSAP finally let the Team take priority on all aspects of the dispatch facility; from call taking to PD, Fire, and EMS dispatching. They even referred to Team Member Thompson as the Queen of FD dispatching. The city is still without electricity, and expected restore date is 9/8. They have running water but only during the hours of 0800-1700, and it is under a boiling effect. There is also a county wide burn ban in effect. Cell service is spotty; some carriers are better than others. After a survey of the PSAP, they sustained about 5% damage from water however it is confined to one area and no longer affecting the equipment. 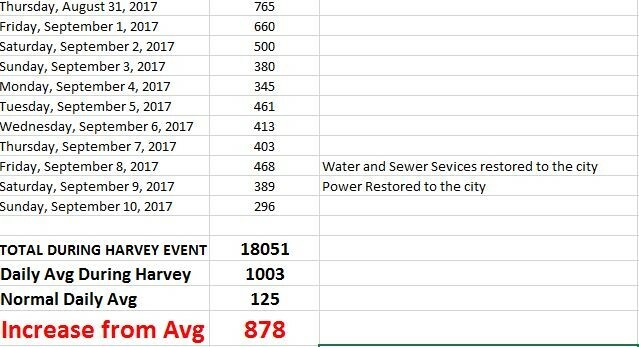 Approximately 40% of the city was affected by the storm, from electricity to building damage, etc. Special Needs/Requests: A second Team has been confirmed and will deploy once the first Team returns. Update: The communication between the Team Leaders was a little spotty today. They lost cell services in a lot of areas and even some land lines. In the process of trying to repair services some fiber optic, lines were cut. The Team will be heading home in the morning once night shift is released. Tomorrow, the Rockport Team will return home and a relief team will be sent to provide 9-1-1 dispatch assistance for seven days. Update: The Rockport relief Team left at 12:30 this afternoon and arrived a little before 5:00 PM. They will begin their shifts in the morning at 7:00 AM. Team Leader Sessums will be working 7 AM – 7 PM and Team Leader Roller will work 7 PM – 7 AM. They are still working out which shift the Team Members are going to work. They are excited to get started and help bring relief to the PSAP. Texas continues to keep track of Hurricane Irma as it makes it way across the Atlantic. Our thoughts go to our Florida TERT family as they prepare for Irma’s arrival. All in all, it was a great day! We fell in with the dispatchers and worked like a well-oiled machine. The crew here was fabulous at answering any and all questions we had. We look forward to working the next six days with them. Today couldn’t have been any more perfect! The folks from different city departments welcomed us in and made sure we had everything we needed. Update: Team Leader Roller along with Team Member Eaves worked the 7 PM to 7 AM shift. Team Leader Roller advised that they had a great evening. She stated the CAD system is fairly easy to get the hang of so they were able to jump right in. She stated more than once how accommodating the PSAP, and all personnel is, they make them feel right at home. Team Leader Sessums advised that the calls continue to be mostly admin related calls about the restoration of utilities and donations. Team Leader Roller created a hot key sheet to help with some shortcuts on the CAD, radio, and phone systems. Team Leader Sessums advised that they are starting aerial spraying for mosquitos this evening. There is still a curfew in place from 1900-0700 for the safety of the citizens. All in all this team is so enthusiastic about being there and having the ability to help out in any way they can. Update: Team Leader Roller advised they had a busy shift last night. Power has been completely restored to half of the city which created a lot of calls for power lines down and other electrical issues. She advised that the Rockport staff has been so good to them. A lot of citizens are returning to their homes, so the calls are increasing. The Team continues to express their gratitude for being able to help the PSAP. Team Leader Sessums advised he doesn’t know how they would be able to handle the call volume without assistance. The only issues to arise is they are having trouble getting outside information on utility restorations and donation locations. Update: Team Leader Roller advised she was able to meet up with a Telecommunicator from the Ingleside group yesterday for a bit and it was nice catching up. They are still dealing with a lot of curfews and burn ban questions. They are slowly getting the power restored but are still completely without water now. Tem Leader Sessums advised that the mandatory evacuation has been lifted so more people are coming into the city causing an increase in calls. They have received updated contact information on donation accepting sited and it has been very useful. The resident Telecommunicators have been so helpful and made the Team feel right at home. Team Leader Sessums stated that being that welcomed makes the work days easier. Update: Team Leader Roller advised the curfew has been moved to 10:00 PM. The water has been turned on throughout the entire city, and almost all of the electricity has been restored. Dispatch Supervisor Lee Zapata has requested a third Team and has submitted a STAR request. Attached is an email sent to the Mayor of Rockport by Team Leader Sessums. It speaks volumes about the character of everyone involved. My name is Cole Sessums, I am a 911 Dispatcher from Williamson County. My team and I have been in your city since Tuesday September 5, assisting and relieving some of the work load off your communication staff. The destruction and devastation your community has sustained by Hurricane Harvey is absolutely heartbreaking! My friends and coworkers back home have asked me how it is here and I simply tell them “there are no words to describe it!”. In the short time we have been here I have met several employees of the City of Rockport and they are all so head strong and positive. It is amazing the strength of the community that I have witnessed, considering everything that has happened. This morning, I decided to contact you all to advise you of the hospitality we have received since arriving in your city, though some of these folks don’t know if the conditions of their homes are suitable to live in but they are constantly making sure we are okay and have everything we need. Lee Zapata and her team of dispatchers have been amazing and have made us feel so comfortable, as if we are at home away from home and they deserve recognition for their hard work. They have experienced an overwhelming increase in phone calls and calls for service in the field. They have all been so composed and focused on doing their jobs, despite the challenges they face in their personal lives, from being separated from their misplaced families to sorting through the damages sustained to their homes. We are honored to be able to come and take some of the weight off their shoulders. The personnel of your public works department have been amazing as well. We have had a fresh cooked meal every night at your city service center and, given the situation, the best accommodations that have been beyond expectations. The folks in public works deserve to be recognized and commended for their generosity. I discovered, through conversation, that the food we have enjoyed during our stay was brought in from the employees of public works, food banks and some from the city. I cannot recall the gentleman’s name but he told me, he and his coworkers emptied their refrigerators and freezers and brought it all to your city service center for use while they were misplaced from their homes during clean-up and restoration of city utilities. They have fed so many people, from law enforcement to I.T., with no expectation of reimbursement or appreciation. Their selflessness is admirable and appreciated and I hope this email gets out to each and every one of them, so they know that we, TERT Team 6 of Williamson County, appreciate everything!!! 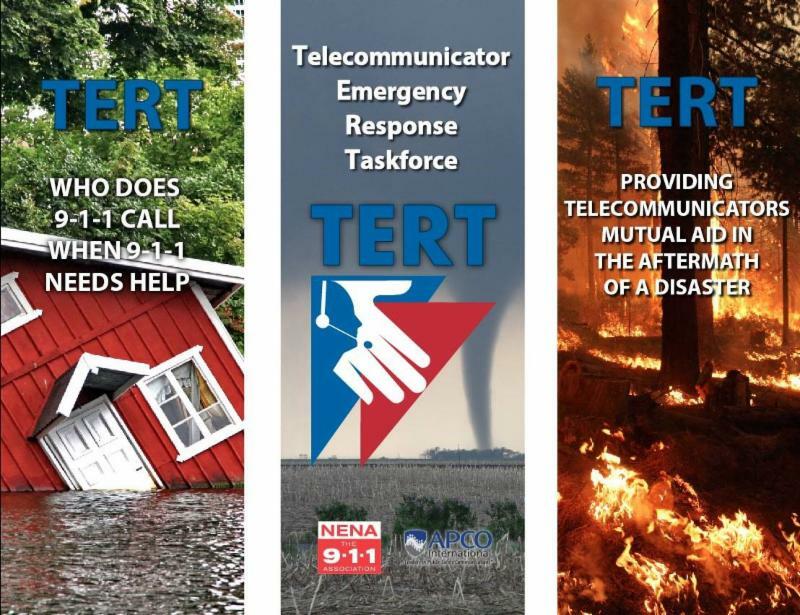 As a team leader of TERT Team 6 and on behalf of Williamson County Emergency Communications, our hearts go out to your community and godspeed your road to recovery! It has been an honor to assist you all in your time of need! Update: Team Leader Sessums advised the call volume has decreased to close to normal call level, according to the supervisor. Majority of calls are people inquiring about the water boil notice and the burn ban. Team Leader Sessums also advised; Their communication center is one-fifth the size of what we are used to at Williamson County Emergency Communications, on average they have two dispatchers, plus reception and the floor supervisor. A number of calls they have received speaks volumes for their need of assistance and relief. I am proud that our agency has had the pleasure of providing the help Rockport needs. I am attaching a picture of the call volume that was provided by Team Leader Sessums. Update: Today is the last day of this Team’s deployment, they will head home at 6:00 AM and once they arrive home the next Team from their agency will head directly back to Rockport for relief. Team Leader Sessums advised that the operations have steadily improved every day in the PSAP and across the City. Team Leader Roller visited the Ingleside Team today so that she could get some pictures and check in on all of them. Team Eight will deploy tomorrow afternoon to provide 9-1-1 dispatch relief at Rockport for seven days. Update: The second Rockport team left this morning around 8:00 AM and arrived home at 11:30 AM. The third relief Team arrived in Rockport at 6:30. They were getting briefed and resting for the night they will start their shift in the morning. Team Leader Todd Benedict and Team Member Lillian McCrary will work the 7 AM – 7 PM shift and Team Leader Rita Martinez along with Team Member Shannon Woolman will work the 7 PM – 7 AM shift. Update: Team Leader Benedict advised himself and Team Member Lilian were having a busy day. They were met this morning for their first shift by a very gracious group. They helped them get settled in and begin to learn the system. The phone lines were very busy today, and Team Leader Benedict advised that it is very evident why TERT assistance is still needed at this PSAP. Update: Team Leader Rubio advised DPS is still in Rockport assisting and they are just as busy answering calls as Rockport PD is. She also advised that the staff has been amazing and they are full of information to help the Team be successful. Team Leader Benedict advised the calls were slower today, but they are preparing for an increase due to rain in the forecast. He also advised there is still a massive amount of cleanup that needs to be done. The Team is fitting in quite well, and they are happy to have the opportunity to help the PSAP. Update: The Team is preparing for their last few shifts in Rockport. They feel very confident in their departure and that the Team will continue to thrive on their own. The Team will depart Thursday morning at 6:00 AM. Team Leader Martinez advised they had to venture out yesterday in search of a laundry facility for the Team. The City employees are also returning to work which is affecting the teams that sleep during the day, but they are still getting enough rest. Update: Team Leader Benedict advised that they are packing up and preparing to leave at 6:00 AM tomorrow. They have enjoyed every minute of their deployment and are sad to be leaving. Both Team Leaders advised that the PSAP and the City have come a long way in the 7 days that they have been there. They feel as though they have made life long friends and they will always remember this amazing opportunity. Update: The final TX TERT Team left Rockport this morning at 7:15 AM and arrived safely home in Georgetown at 12:45 PM. The Teams parting words were: Thank you for the opportunity, and the experience was amazing.